Matterhorn White Base paint with Platinum, red and blue accent stripes. Paint is in excellent condition. On IFA (increased Flight Activity) inspection program. XM/Sirius radio installed for Cabin entertainment. Gantt Aviation was founded in 1971 in Georgetown, Texas. Since opening for business, Gantt Aviation has helped set the standards for ethical business practices and optimal levels of customer service among aircraft brokers and aircraft dealers around the country. 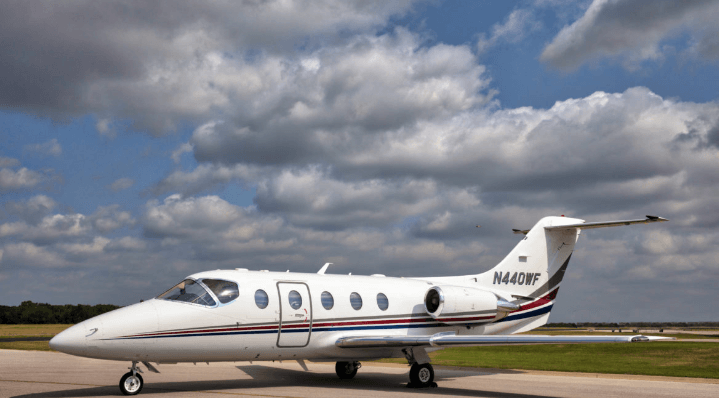 Gantt Aviation buys, sells, and trades pre-owned corporate jets and turbo props. Brands that we have worked with include Citation, Learjet, Merlin, Cessna, and King Air. Gantt Aviation is proud to go beyond the services of a typical jet broker by maintaining our own inventory of business jets and turbo props. We house our inventory of corporate jets in a 40,000 square foot hangar that is equipped with its own service and refueling center – a service center exclusively reserved for Gantt Aviation clients. At Gantt Aviation we are both jet dealers and jet brokers. Our highly experienced team has an excellent reputation of helping our clients with jet sales, aircraft acquisitions, trades, contract negotiations, insurance set up, market research, and more. We’ve even been known to help our clients buy jets not listed on the market. At Gantt Aviation, we strive to take the hassle out of aircraft sales and purchases for our clients by helping them make informed decisions. Gantt Aviation is more than an aircraft sales company. We’re a leader in the jet sales industry in terms of ethical business practices. In fact, our founder is one of the creators of the National Aircraft Resale Association (NARA), an organization dedicated to upholding high ethical standards throughout the industry. By always putting the customer first, Gantt Aviation has built a reputation of quality, integrity, and intelligence.